Have you ever tried a VR educational experience? 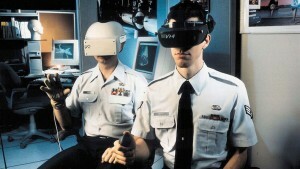 First of all, we wanted to know if the current VR users already tried an educational experience in virtual reality. 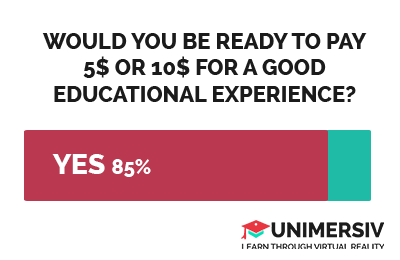 The answers where surprising, 57% of the respondents answered that they never tried a VR educational experience. 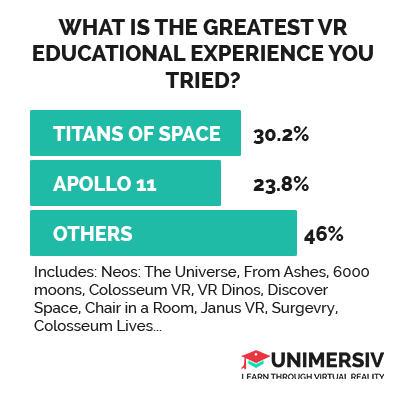 Knowing that Titans of Space is one of the most downloaded experience on the Oculus Share, we were expecting a different result. If yes, what is the greatest VR educational experience you tried? Do you think that VR can be used to help people learn something new? 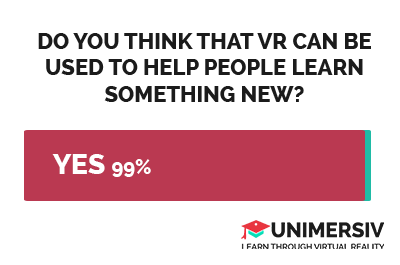 Then, it was important for us to know if people though that VR could be used for educational purposes and the answers were straightforward: 99% of the respondents answered Yes. This reinforces our belief in the fact that we should use VR to help people learn faster. VR can give you experiences no educational book or video could and we want to embrace that. What is the most important factor that makes a VR educational experience good? 43.9% selected the answer “The ability to actually learn something” . 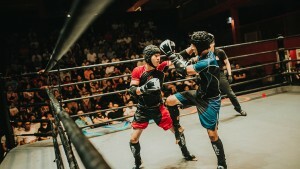 Some users leaved some really interesting comments stating that we shouldn’t fall in the trap of trying too much to “blow the user’s mind and really focus on teaching the users something new. 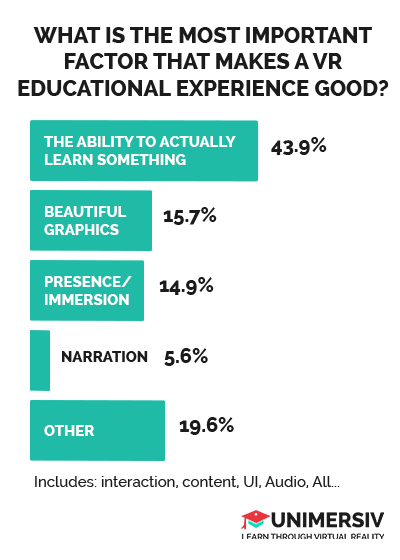 The next best answers were “Beautiful graphics” with 15.5% and Presence/Immersion with 14.9%. Interesting fact, 14.9% of the respondents used the “other” field to state that “immersion” or the “feeling of presence” were decisive to create a good educational experience. Would you be ready to pay $5 or $10 for a good educational experience? The next question was related to the business potential of VR education. 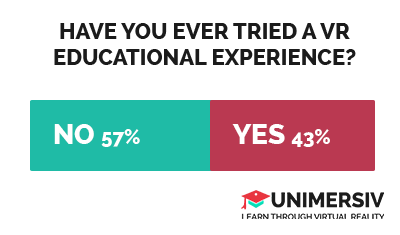 We asked the respondents if they would be “ready to pay $5 or $10 for a good educational experience?” and the Yes clearly won. 85% of the respondents answered Yes. Which means that there is a great potential for companies or indie developer involved in VR education to create a successful businesses. 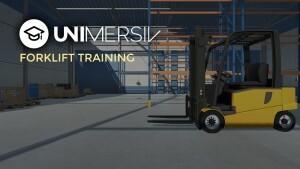 What company name do you associate with VR Education? The answers were interesting, 35.1% of the respondents said that they are not associating any company to VR Education for now. They other answers were divided between the suggested companies with Immersive VR Education and Unimersiv as the top answers. 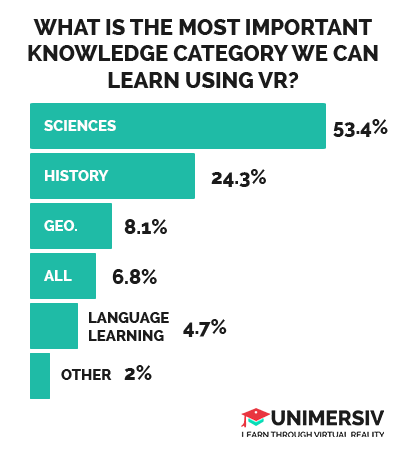 What is the most important knowledge category we can learn using VR? 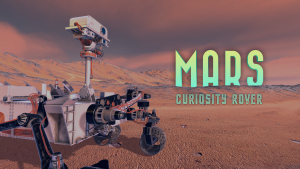 One of the main things we learned from this survey is that VR Education has a bright future, we strongly encourage indie developers to share a part of their knowledge through a VR experience. 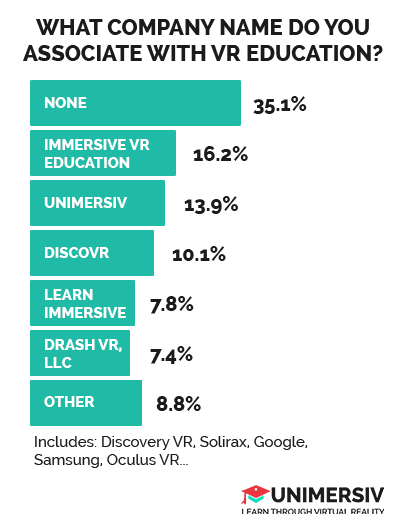 VR users are interested in using VR educational experiences from all of the categories listed above and most of them are ready to pay for that. Even if some educational experiences are more famous than others there are no clear leaders yet in this industry. When creating educational experiences we shouldn’t focus only on “blowing the users mind” but especially on teaching something to the user. 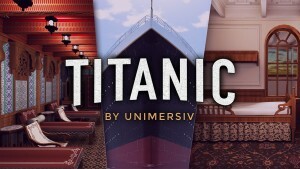 If you have any questions about that survey or if you are interested in publishing your own VR educational experience on Unimersiv, you can email me at baptiste@unimersiv.com. We would like to thank the users of r/oculus, r/virtualreality and r/cardboard, the members of the Facebook groups “VIRTUAL REALITY” and “Oculus Rift (VR Headset) Creative Community” and all of the people that took the time to answer this survey. 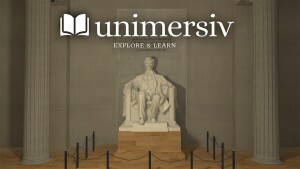 If you want to receive frequent news about VR education you can follow us on Twitter – @Unimersiv.